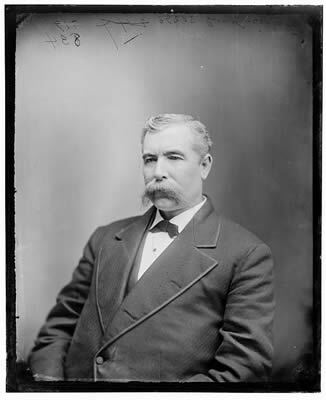 Ohio governor Thomas Lowry Young was born in Killyleagh, County Down, Ireland, on December 4, 1832 (some sources say December 14). When Young was twelve years old, he immigrated with his parents to the United States. He spent the rest of his childhood in New York City and attended public schools. Young joined the United States Army in 1848, as the Mexican-American War was coming to an end. He spent the next ten years as a musician in the army. When he left the military in early 1858, he held the rank of first sergeant. The following year, Young moved to Cincinnati, Ohio, where he became the assistant superintendent of the House of Refuge Reform School for Youth. He also taught at the school. When the American Civil War began, Young volunteered for service. From September to December 1861, he served as a captain in General John C. Fremont's bodyguard. He then returned to Ohio, where he worked as the editor of a Democratic Party newspaper in Sydney for a few months. Unlike Peace Democrats, who criticized Abraham Lincoln's administration for going to war with the Confederacy, Young argued that the Union should be more decisive in fighting the war. Young returned to military service in August 1862, when he received a commission as a major in the 118th Ohio Volunteer Infantry. After serving for several months in Kentucky, Young and his regiment were dispatched to eastern Tennessee. Young was promoted to lieutenant colonel on April 17, 1863, and then to colonel on April 11, 1864. He participated in the Battle of Resaca, near Dalton, Georgia, where he led his men in a charge that resulted in the deaths of 106 of the 270 men under his command. Young suffered from poor health throughout the year and resigned his commission in September 1864. Because of his service record, President Lincoln awarded him the rank of brevet brigadier general on March 13, 1865. After his discharge from the army, Young returned to his home in Cincinnati where he decided to seek a new career and studied the law. Young passed the bar examination in April 1865. In that same year, Young entered politics for the first time and became Cincinnati's assistant city auditor in April 1865. In the fall, he was elected to the Ohio House of Representatives. In 1867, he became the recorder of Hamilton County. He resigned as recorder the next year when President Andrew Johnson named him solicitor of internal revenue for Ohio's southern district. He served only one year before resigning. By this time, Young had joined the Republican Party. Young worked with real estate investments over the next two years before returning to politics in 1871. He successfully ran for the Ohio Senate in that year. After his term, Young returned home and began to practice law once again. By the 1870s, Young was a well-respected figure within Ohio's Republican Party. When Rutherford B. Hayes ran for governor in 1875, the Republicans chose Young as the party's candidate for lieutenant governor. Both men were elected. When Hayes resigned to become President of the United States, Young became Ohio's thirty-third governor. Although Young only served as governor for less than one year, he faced an important challenge during his term. Ohio, as well as many other states, faced serious labor problems during this era. Although businesses had grown at a rapid pace after the Civil War, many people still faced poor working conditions and low pay. In July 1877, a national railroad strike spread to the state of Ohio. Some state governors appealed to the federal government for military support. Young addressed the strike in Ohio by using the state militia. After a few weeks, the strike was settled, and the militia troops returned home. Young restored order in Ohio, but he was unable to address many of the issues that had caused the strike. After leaving the governorship, Young was elected to the United States House of Representatives for two terms and served from 1879 to 1883. After failing to win a third term, Young returned to his law practice in Cincinnati. Governor Joseph Foraker appointed Young to the Cincinnati Board of Public Affairs in 1886. He still held that position when he died on July 20, 1888. Young was buried in Cincinnati's Spring Grove Cemetery. Marchman, Watt P. "Thomas L. Young: 1877-1878." The Ohio History Connection. Ohio Fundamental Documents Searchable Database. http://www.ohiohistory.org/onlinedoc/ohgovernment/governors/young.html.